Mobile event apps are an information hub, communication tool, engagement device, and data gold mine. Mobile data is gathered in real time, which means you can see what your attendees are using the app for as they’re using it. 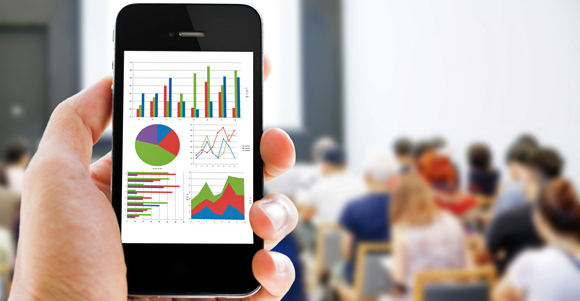 Using mobile app data to redesign your meeting and enhance attendee engagement will greatly improve the event experience for participants, sponsors, exhibitors, and speakers. However, understanding data can be confusing if you don’t know what to look for and how to draw actionable insights. Analytics reports capture a lot about your attendees, including how often they’re using the app, what they’re using it for, their personal preferences, sponsorship ROI, and much more. Visitors and pageviews - By tracking when attendees access a mobile app, you can easily determine what type of communication/promotion tool drives the most action: email vs newsletter vs social media, etc. You’re also able to determine when an attendee is interested in hearing more about the event, whether that be a month before, a week before, or even a day before. Understanding mobile app traffic allows the event organizer to create a communications strategy that appeals to the attendees’ preferences. Device breakdown - Understand how your audience is accessing your app in order to provide technology that applies to every attendee. Apple vs Android? Desktop vs Mobile? Ensure no attendee is left behind by confirming that the technology you are purchasing works on devices most commonly used by your audience. Top sections - By tracking what sections of a mobile app had the most traffic, you can determine what attendees were interested in. The sections most explored can indicate where you should include important content, as well as aid in creating a mobile sponsorship strategy. Higher traffic should lead to a higher sponsor price tag. Top exhibitor/sponsor profiles - Being an event exhibitor or sponsor can be a hefty investment, which means that you should showcase the value behind a company’s involvement. Take a look at the most visited profiles and make an effort to understand what those profiles have in common in order to draw best practices. Report back to your partners about traffic on their profile and other exposure opportunities available in the app to bolster profile views. Looking at numbers like banner ads and push notification clicks will help ensure your top sponsors get maximum brand exposure. Top speakers/sessions - What speaker profiles and sessions were viewed the most? Compare clicks to feedback from overall event surveys to understand who to bring back next year. Consider the topics being covered, style of speaking and room format, as well as the audience demographic. Surveys/feedback - It’s no secret that event organizers struggle with attendees filling out surveys. Data helps you gain insight into how to build a survey that will drive more participation. Are attendees completing the whole survey or only a few questions? Did attendees prefer to answer multiple choice or open-ended questions? Did driving attention to a survey with a mobile alert or having the survey promoted on the main screen of the app have an effect? Data can help answer your questions so that your attendees answer questions too! Notes/documents downloaded - The number of notes taken and documents downloaded, as well as looking at what sessions the notes and documents are associated with can indicate the quality of the learning and how engaged the audience was with the content. Info booth - The most visited pages in your info booth will indicate what information might need more emphasis in the future. Any questions that are frequently asked through the app should also be noted, as there may be an opportunity to provide more relevant information and reduce questions onsite. Gamification/incentive - Consider what percentage of attendees participated in your event game. If you had low adoption, why? Did you promote the game enough before and during the event? Were the challenges too difficult? Are the prizes staggered and valuable enough? Take note of who won the game; consider reaching out to those individuals next year to be promotion advocates for the game. Mobile app data, when used properly, is your greatest source of feedback when aiming to design the perfect meeting for your attendees. This entry was posted in Event Operations, Social Media & Technology and tagged mobile apps.